I was a reluctant eBook adopter. I love books, and devoured them so quickly growing up that my mum had to ration the number I was allowed to buy after I’d blown through the local library’s supply of children’s and teen fiction. I’d get through five or six paperbacks on a family holiday and then beg and plead to be allowed to buy a few more in bookshops we passed. I grew up in a house full of books, and I remember vividly the moment when I realised what a gift that is. Alone in my parents’ house a couple of years after moving out, I found myself with some time to fill. I made a cup of tea, and thought for a few minutes about how I’d spend the time. I was wishing I’d brought my laptop so I could watch some TV or catch up on emails. Then I looked around, realised I was surrounded by bookcases full of wonderful books I’d never read, all pre-vetted by my dad (the most devout reader I’ve ever encountered) as being worthwhile. I spent a blissful half hour wandering around the house, pulling out books almost at random, reading the backs, flicking through a few pages, and gradually building up a pile of about ten before I realised I had enough to occupy myself with! I got stuck into one, brought the rest away with me to read later, and found myself appreciating in an altogether new way just how wonderful it is to be raised by parents who are avid readers. The last 10 years have brought eBooks entirely into the mainstream, and caused a lot of people to pick sides: for or against. It seems like whether you love books or are only an occasional reader, you’ll find your own personal reasons to either adopt the eBook life wholesale, or shun it in favour of your musty paperbacks and the traditional reading experience. People who have pretty much adopted the eBook model – but feel guilty about it, and feel anxious and conflicted if they examine their decision too closely. See, I just can’t deal with the idea that my kids won’t be able to wander around my house, flicking through my bookshelves in twenty years. eBooks are incredible versatile, and I absolutely adore the fact that I can read a book on my Kindle outside during the day, pick up where I left off on a train journey using my laptop, and then sneak in a few more pages on my iPhone if I wake up in the middle of the night. That, to me, is living in the future – and I am totally addicted. As somebody who at any given moment has between 5 and 10 books (my fiancée would probably say 10-15) stacked up on my bedside table, having the ability to effortlessly keep several books with me at all times, with my current page automatically synced between them is a tremendous gift. Add in the instant gratification of buying new books (Amazon 1-Click making it even better more dangerous), shared annotations (seeing other readers’ highlighted passages in non-fiction can be an incredible aid when speed reading), and having a portable PDF reader I can simply email documents to when I’m in a rush – and I’m infatuated. But that’s not to say I don’t look back. I detest D.R.M. (Digital Rights Management, the kind of technology which stops you from, say, transferring your Amazon eBooks to a Sony Nook, or onto your new gadget which Amazon doesn’t approve of). The notion that these books I’ve been so delightedly buying from Amazon and filling my ‘Kindle library’ with could one day be completely inaccessible from my 2020-era personal computer, or may never be readable by my children because it doesn’t make business sense for Amazon? That still ties my stomach in knots. So when my sister and her husband gave me the generous gift of a Kindle for my 25th birthday, I was shocked and delighted. And confused. I certainly didn’t feel ready to start exclusively buying books electronically. But I knew that as soon as I began to, it would inevitably be a slippery slope which (in my mind) ended with me having no library to share with my children, and no log of my reading through the years (something provided automatically by the accumulation of physical books). It’s a beautiful device. I started it up, downloaded a book, transferred over a PDF of one of the upcoming articles for EasyEarTraining.com. I put it aside later in the evening, then kept catching glimpses of it across the room, where it confused my peripheral vision by looking like paper yet showing a different image every few minutes. As time passed, and I got the Kindle app for my iPhone, my laptop, and eventually my iPad, I realised the undeniable convenience of having my current reading in an always-accessible distributed library, and I gradually gave in. Six months after receiving my Kindle, I had totally integrated it into my life. I was immersed in trying to get my new company off the ground, and when I’d realise in the morning that I had 20 minutes to get out the door and catch the train to my day job, I would quickly email my Kindle the remaining documents I needed to go over, throw it in my bag and run down to King’s Cross to catch the train with moments to spare. And then I’d relax, get out the Kindle, and resume my work. If time allowed I’d flick over to the latest ‘personalised magazine’ of articles which Instapaper had sent to the Kindle after I’d marked them ‘Read Later’ while browsing the web. When I found myself up in the French alps visiting my sister and remembered I’d never started Nick Harkaway’s “Gone Away World” but really wanted to, I was able to grab a digital copy and get stuck into the first chapter within minutes of the urge striking me. 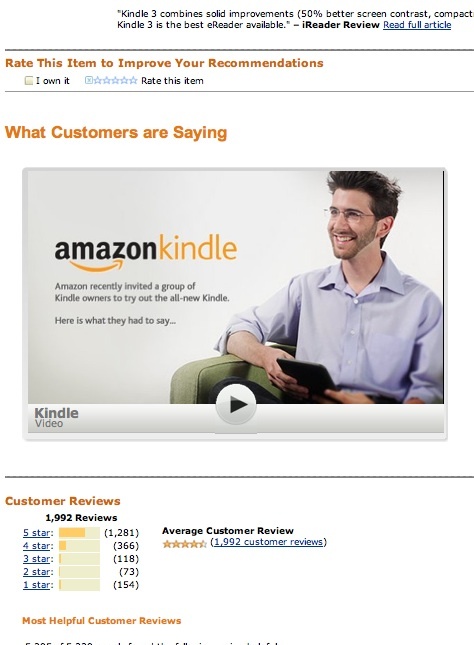 So when an Amazon email invited me to take a customer survey about the Kindle, I happily responded. I don’t remember what they asked, but I have no doubt I was enthusiastic, made some positive comments about commuting and Instapaper, and threw in a mini-rant about D.R.M. About a month later another email arrived, to say I’d been selected to appear in a customer marketing video, and would I please sign and return the attached N.D.A.? The tech news sites had been speculating about a new Kindle being imminent, so I was excited to think I might get a sneak beta preview. Nothing happened for a month or so, and I began to wonder if I’d been un-selected. Maybe my vague tweet about it breached the N.D.A. and an Amazon lawyer decided I was too risky. Yes, paranoia sometimes gets the best of me. In July however, I received another missive, setting out dates and times for a video shoot. I was to bring my Kindle and any other devices I use to read Kindle books (which made for a fairly stuffed and valuable shoulder bag!) and that was apparently all the preparation I needed. I walked into the building slightly apprehensive since it looked nothing like a TV studio, and was relieved to find a darkened room and film crew set up inside. I met the Amazon representative I’d been corresponding with by email. I’ll leave out names here – but I should note that everyone I met from Amazon was very relaxed, welcoming and accommodating. They sat me down, and introduced me to the new Kindle. That in itself wasn’t so surprising, but the device itself really was. Naturally, I’d been wondering what a new Kindle might have in store. And honestly, I’d drawn a bit of a blank. I couldn’t see them going to a colour or touch screen. And my existing Kindle was already light, easy to use and always connected to a great bookstore. So I was, like the oysters, curious. As is public knowledge by now, the new Kindle isn’t a complete re-think – it’s simply an excellent refinement of what was already a great device. It’s sleekier, its buttons make more sense (particularly the arrow pad substitution for the old directional button, and page turners on both sides), the display significantly clearer, and the whole user interface noticeably more responsive. I remember being impressed that it now automatically removes the menubar once you start reading a book, providing more usable screen space than the Kindle 2. I was impressed – and oddly pleased. I think when you commit to a device and integrate it into your daily life, you inevitably become emotionally invested in its future success. In this case I was happy. I didn’t know if I’d be rushing out to buy one, but I was confident that it would help build the Kindle brand, and I was pleased to see the direction they were taking the device in case I did decide to upgrade or replace mine down the line. It was a relief to find they hadn’t taken an odd swerve with the product line, and a surprise that they’d found so many ways to improve on a device I already considered extremely well designed. Being a tech geek myself and having spent countless hours working on user interfaces, I’m quite aware of how hard a task it is and how much work goes into making something feel ‘natural’ or (hated word of UI designers) ‘intuitive’. This made it all the more striking that a user experience I considered great had been roundly trumped. So, having spent half an hour playing around with the new Kindle, and comparing side-by-side with my own, I was brought through to the studio. The ‘interview’ was really more of a chat. I was given some guidance on how to phrase my responses to make editing the footage together easier, but apart from that very little suggestion or requests about what to say. They made me feel comfortable speaking freely, honestly and as expansively as I liked about the device. … and I geeked out. 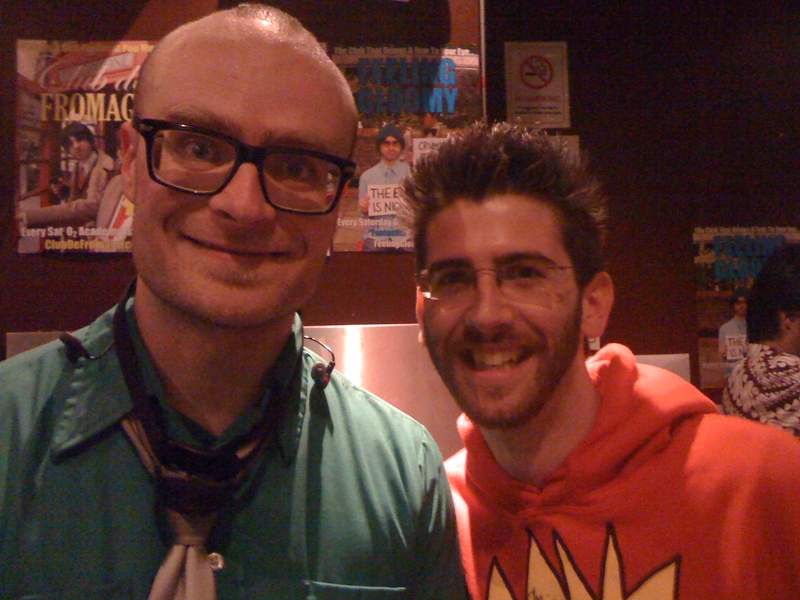 I, like many geeks of all flavours, must confess to having an inner fanboy. And he mostly is kept inside. But once in a while (like when you meet one of your heroes or love a snack food so much you follow its strange unofficial representative on Twitter) you just can’t help but let it out. It’s not often you get to express your appreciation for a tech gadget in person to those who are (at least peripherally) involved with its design and creation. I believe all the staff there were on the marketing rather than tech side, but still intimately involved with the Kindle project, and I think a part of me just wanted to say thank you – for creating a device which had made my life easier and more enjoyable over the last six months. So I may have gushed a little. I certainly enthused. I told an embarrassing story about dropping my Kindle in front of a queue of traffic, triggering howls of laughter from drivers. I talked about my unease with eBooks in general, and how the Kindle had won me over. At the end, when they asked if there was anything they’d forgotten to ask me about, I gave them an all-guns-blazing, love-it-to-death elevator pitch for Instapaper and its ‘send to Kindle’ feature. I have a habit of talking quickly when I’m excited, so I tried to tone that down a bit. I tried to stay fairly formal in my speech despite the relaxed atmosphere. I didn’t say anything I didn’t mean, but I was aware I was probably giving them exactly the kind of testimonial they were hoping for. I hoped that it wouldn’t come across too fanboyish, or worse, scripted. After spending 20 minutes or so geeking out over one of my favourite gadgets, it was time for them to move onto the next person. I was de-microphoned, and led back to the prep room to retrieve my now-slightly-retro-looking Kindle 2 and head home. After this slightly surreal morning I returned to my usual life, re-reading Scott Pilgrim Volume 1. And then 2, 3, 4, and 5 before my newly-arrived volume 6. And soon the subject of the Kindle drifted off my mind. I’d asked about when it would be released (and whether I could keep the one I’d been trying out) and they said “end of summer” (and “no”). In late July the new Kindle was announced, and I excitedly told anyone who’d listen about how great it was, managing to do so without explaining how I knew. Who knows how seriously N.D.A.s are taken? I spent August in Canada, bringing no physical books with me for the first time ever, relying on iPad and Kindle to supply my holiday reading. They did so without a hitch, and like when I was a kid, I ended up buying a few more books during the trip when I ran low on reading material. This time though, it was instantaneous, powered by Wi-Fi in a net café. You can currently find the video on the Kindle page and there’s an inexplicably smaller but hopefully more permanently available version on this page. The people in the video are uniformly really enthusiastic – and of course you’d expect that from a promotional video with carefully-selected participants. And you can work wonders in the editing room. But for what it’s worth, I doubt they had to work hard to find positive snippets. This is a device that engenders real love in its users, and I suspect the other people in the video, like me, struggled to contain their inner fanboy/girl. It should be clear at this point: I love my Kindle. I hate that its books are crippled by D.R.M., and I still have moments of real concern that I’m somehow cheating my future children the bookshelves I benefitted so much from growing up. I’ll occasionally buy a book in physical form because I think it’s one I’d like to have on my shelf – and bizarrely, I’ll feel guilty about that too, knowing it’s not as convenient as the electronic version would be. I remain optimistic that Amazon are quietly pushing (the way Apple did) to gradually wean publishers off the ridiculous promises of D.R.M. vendors, so that we can all enjoy the content we buy in the fullest way modern technology can allow. For now, the day-to-day benefits of the Kindle considerably outweigh the occasional moments of panic about an imagined future. I’ll probably keep buying eBooks, and I’ll probably keep buying occasional ‘old-school’ books. I expect I’ll continue to feel conflicted and guilty about both. And I’ll feel like I’m living in the future. And that my kids are going to laugh when they hear I held onto physical books for so long. totally agree. something subtle about the interaction with the device makes it very, very pleasing. now if only they would open up my KDK access..
I’ve been reading love and hate stories about the Kindle and ebooks readers in general, and while I’m pretty convinced of its potential for regular books replacement, I’m not certain of its behavior with PDF or HTML files. Any thought on that ? I’ve been pretty impressed. Generally between changing font size (or zoom level) and rotating the screen 90 degrees when necessary, I can find a comfortable way to read pretty much any HTML or PDF file. I’ve taken HTML files mostly from Project Gutenberg, and PDFs from all over the place, and rarely had difficulty. The one exception is scientific papers, where I’ve found the two-column layout to be fairly tedious to read – you have to zoom in on one column, then scroll down, then manoeuvre your way to the top of the second column and scroll down again. That really is the only case which has frustrated me though. The other thing worth noting is that you can email most types of document to your Kindle’s email address and they’ll be auto-converted and sent to your Kindle. You pay a small charge for this, but it can be very handy! I haven’t paid close attention to the accuracy of formatting translation, but no glaring issues either. I’ve read about that “small fee” before. Don’t really like the idea. How much is it ? 1 cent ? 10 cents ? As an anecdote for your future kids, I just spent two days emptied an old family library. About 900 books, most of them eaten by years on open shelves… and after spending hours carrying huge bags and boxes around, I can tell you, your kids will LOVE ebooks !!! Heh 🙂 I was definitely conscious of that aspect when going on holiday – eBooks make for a much lighter suitcase! I’ve actually been paying a fair bit for document delivery over the last year: about $1/document. However, U.S. customers have been paying $0.15/MB (rounded up), and now that there’s a U.K.-native Kindle store, that should be £0.20/MB for me in future. Looking at my account history, almost every document was under a megabyte – I’m pretty happy paying 20p a shot for the convenience. Dude – button your collar or get a shirt with a button-down collar, get a haircut, and shave. Also, consider new eyeglass frames. “I’m not a particularly image-conscious guy”? Also, I apparently looked decent enough for Amazon to use my picture as the video preview despite all the other better-looking people in the video. 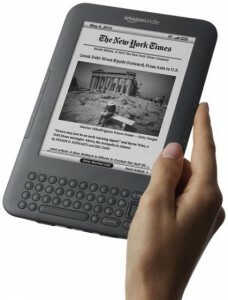 I had Kindle 2 and now have Kindle 3…I love reading on them ..they are part of my life now…. Great writeup Christopher I really enjoyed it. So the big question… Did Amazon give you a new Kindle as a thank you gift? If not did you upgrade from your K2? Sadly no free Kindle 3… I haven’t been able to justify an upgrade yet, as my current Kindle’s still a great device. It is tempting though at the low price point they’ve chosen. What’s the keyboard like on the Kindle 3 compared to say a Netbook or an iPad? 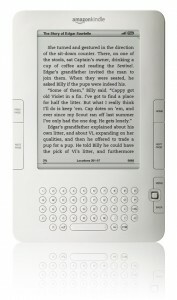 I prefer e-paper to a backlit display for reading so a Kindle seems like a good choice. I’m not sure it’s too well suited to that, unfortunately. The keyboard keys are very small, and although it’s fine for making short annotations and notes, I wouldn’t want to write anything very long on it. I tend to type with my thumbs on it, but I suppose if you laid it flat and used fingers it might be quicker. Perhaps you’d get used to it.